For the past three summers, come early July, Frances and her crew make a journey along the coast of Maine with a camp from Rhode Island. Camp Williwaw hails from Bristol, though the nucleus of this 23-day expeditionary trip is a large white van and trailer from which twelve campers (w guides) exist as they conquer our state each July. On July 6 we set sail from our berth in Portland for new places and spaces to share with these teenagers hailing from Europe and the United States. Two called Paris home, one was from the Basque Country, and the remaining were from cities across the US. They were 15, 16, & 17 years old. They had been sent away to summer camp. We can all remember this feeling. I read a poem by Carl Adamshick called Loss, upon my return from our Williwaw adventure. I could not help but think of the company I had kept with these kids, and of the coming of age that they were all at. Somewhere between having to grow up fast and between still having an honest innocence that only a child can truly embrace. It can be seen in the sheer joy of diving into the green Maine ocean after a day of sailing in the heat of the sun. It is in the laughter. In the running and racing across the beach, in the swirling of the night stars when we lie on our backs at anchor and watch the night sky. This teenage summer happiness is pure bliss. Not a care in the world, but at the same time every care and every worry in the world. It was my favorite part of this trip this year. The way I could still see the child in each one of them, the child who wanted to hold on to summer forever. He who just wanted to be loved by his peers and accepted. He who maybe had a tough year at school or whose parents may be separating, or who may be slightly headed down the wrong track and had been sent away to camp to set a better course. I like that for four days we all ran wild like children in the Maine wilderness again. Waste high grass and ink black night sky. The laughter was real and rolling. 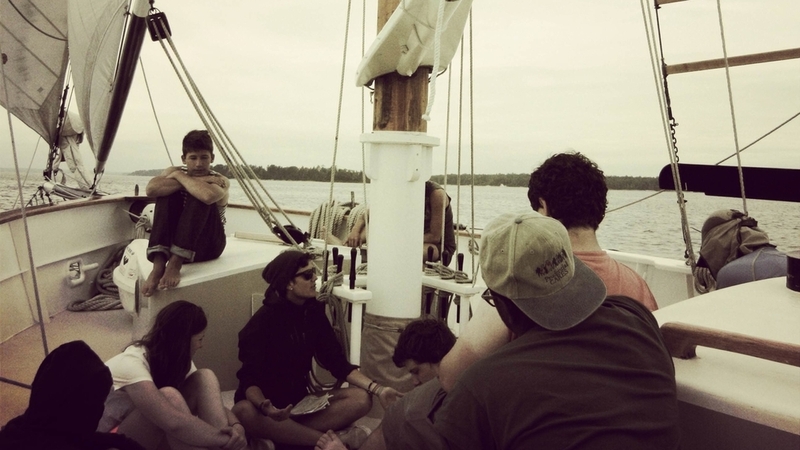 Four Frances crew took fourteen campers sailing up the coast of Maine. We charted our lives in nautical terms on old worn charts from the lazarette. Together we made an artistic collage of the path of our lives; in irons at times, tacking back and forth in a fierce upwind beat at others. Sometimes life offered an easy downwind run. Sometimes there was fog, sometimes we were becalmed. The metaphors made between sailing and living are real ones. We shared our stories. There were tears too. I have been reminded to try not to forget what it is to be a child. To live in a tent, to pitch it right on the waters edge facing east between the granite outcrops and pines of Maine’s coast. To stay up too late in wide-open spaces. To count stars, and to reclaim the happiness of being a child in summer again. To keep the rucksack of childhood innocence close, and to remember to open it. Often. Wind lifting leaves from branches. this is where it was lost. The sadness isn’t their sadness. willowing through the bottom half of waves. I keep trying to figure out just how old this old tree was. They say you can count the rings from the center out to the bark and get the age. How many years did she stand tall in the forests of Oregon? Visiting our tree (more literally our stack of vertical grain boards, once a tree) it is apparent there is energy in her still. I comment on this as a little bearded fellow in shorts and hiking boots (on this 50 degree day) loads our stack of lumber on to the back of a trailer normally put to use to haul hay. Not everyday do we drag the makings of a mast down the back roads of coastal Maine. Today is an important day. This energy I speak of can be found in the silent stacks of wood, old wood, that rest in a barn in Washington, Maine. 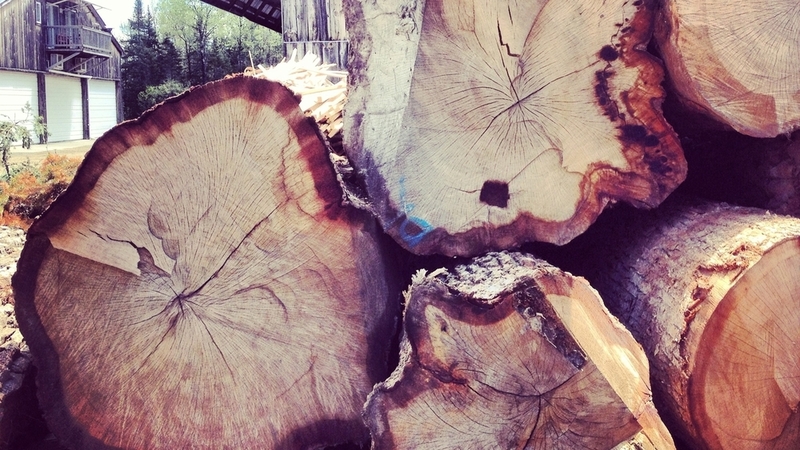 Our wood is set aside and ready to go to its new home, with its new purpose. The other wood is left behind for the time being. It is all so beautiful, and it has all taken so much time to come to its form on this earth. I feel a level of humility standing in its presence. The crew says I have a romantic outlook on things. And I’m thinking: how could you not? I did observe that afternoon every person in that barn take a moment to lay their hands on the grain and look at it slowly and with respect for its perfection. There was not a hand that rest to admire that did not contemplate the things of grace this natural world builds, and continues with resilience, to build. In the making of this west coast douglas fir, to its ultimate unmaking at age “x” in a saw mill in northern Maine, to its building again as a mainmast for Frances, this wood is now family. She was beautiful in her stand, and I hope we are putting her back together just the way she likes. Laminated, our spar will be stronger. Some say it will last us a hundred years if we care for her correctly. Linseed oils, pine tar, beeswax. I say to that: my goodness, I certainly hope so. There is so much to be done in these 100 years. Come meet our mast in June. We’ll be on the Maine State Pier.